Origin and Habitat: Northern Cape (Steinkopf. ), South Africa. Although Albuca unifoliata has a highly restricted distribution (Extent of occupancy 448 km²) and is known from fewer than five locations, it is very common where it occurs, although somewhat sparsely scattered and difficult to spot in the non-flowering stage. Habitat and Ecology: Namaqualand Klipkoppe Shrubland, Namaqualand Shale Shrubland. This species grows on quartzite patches. Overgrazing and trampling is causing ongoing degradation of this species' habitat. 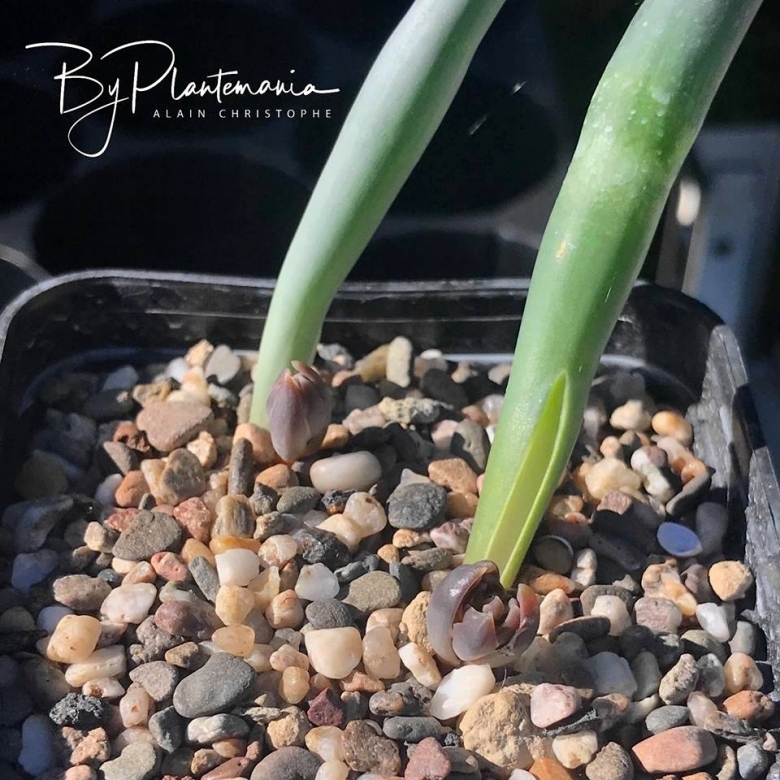 Description: Albuca unifoliata (syn: Ornithogalum unifoliatum) is a small bulbous plant with only one, very firm, succulent, club-shaped leaf each winter. It is mesemb-like in its extreme reduction of surface area and elegant in its simplicity. The buds on this species are more interesting than the flowers. The leaf splits at the base as the flower stalks emerge. This plant will go dormant within a few weeks after flowering. Leaf: One, protheranthous (a plant whose flowers appear before the leaves), absent at anthesis, recurved, clavate (shaped like an insect abdomen), c. 40 mm long, 10 mm in diameter succulent, smooth. Inflorescence: Raceme 5-9-flowered, up to 120 mm long; peduncle c. 50 mm long, bracts triangular- acuminate, 10 mm long, with membranous margins; pedicels erecto-patent, 10 mm. Flowers: Perianth-segments narrowly oblong, 15 mm long, yellow, green-keeled. Seeds: Flat, semicircular, angled, 1.7 mm by 0.8 mm, with a uniformly pustulate black glossy surface. similar species: Albuca unifoliata and Drimia acarophylla are vegetatively almost indistinguishable. Possibly because this two taxa evolved in parallel in response to their extreme microhabitats. 5) Müller-Doblies, U. and Müller-Doblies, D. 1996. "Revisionula incompleta Ornithogalorum Austro-Africanorum (Hyacinthaceae)". Feddes Repertorium 107(5-6):361-548.